Zesty, fresh, smoky, and accented with a burst of citrus, this salad will wow your summer guests. 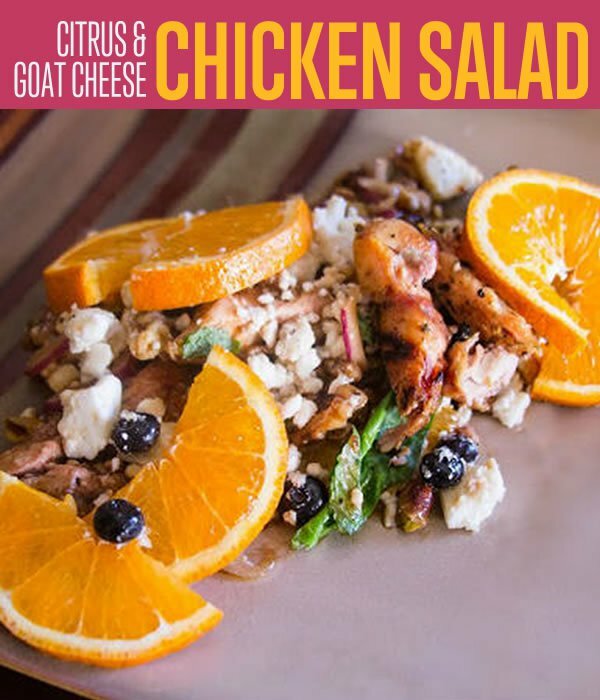 The chicken, goat cheese, and nuts, make this a salad appropriate as an appetizer or an entree. Get your shopping bags ready and complete the list for an amazing Summer salad. Shell all of those pistachios! If you can, you can go to Costco and get a nice big bag of already-shelled pistachios. Crumble up the goat cheese feta and toss it together with the candied nuts, blueberries, and sprigs of fresh mint. Grill up your chicken with the zesty lemon spice. I used my Traeger to get a lovely, smoky taste, but you can certainly oven-roast the chicken, as well! Slice up your red onion, and combine it in a bowl with the balsamic vinaigrette (entire bottle), and the pistachios. Mix all of that together and let the wonderful flavors mingle in the refrigerator as you prepare the rest of the dish. Dice up your grapefruits and slice up your tangelos/oranges. Lay them across the bed of spinach in your salad bowl. Originally I used more grapefruit slices than are pictured, but they were so tart that I took some of them off and let it be a zingy accent flavor rather than an overpowering bitterness. Spread your feta mixture from Step 2 over the salad. Once your chicken is cooked and cooled, slice it up and lay it across the top of the salad. I’d recommend chilling it in the refrigerator for a while, so that it doesn’t wither the spinach while it’s warm. Time for that lovely balsamic dressing that has been chilling in the refrigerator. Pour it over the top. Now mix up the salad, and you are ready to serve! A simple yet flavorful healthy salad recipe that will taste like Summer any season.